Everyone has grand ideas when it comes to hosting a Super (awesome!) Bowl Party. You’ll make all those dips you’ve had pinned to your “Get In My Belly” board for months, marinate ribs overnight so they’re extra flavorful, and maybe even bake whoopie pies -- with frosting dyed in the team colors -- from scratch! Then reality hits you square in the face: you don’t have time for this, and wish you could just have all this deliciousness delivered. Breathe a sigh of relief, because we’ve rounded-up the best delivery option in Manhattan, by neighborhood, and even what to order at each one. Your team’s performance aside, it’s all good. 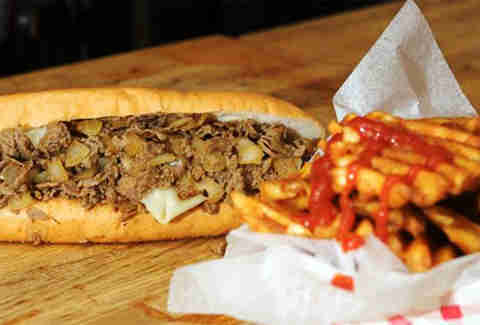 Yes you can get legit Philly cheesesteaks, without actually having to be in Philly. 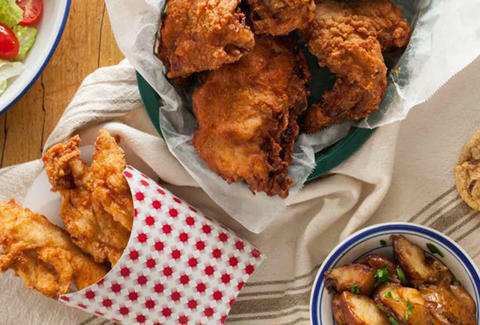 A counter-service joint that slings chicken in about every form possible, plus sides. In other words, hello entire Game Day spread!What you’re ordering: 15-piece chicken fingers with four sides (for the record, at least two of those sides should be mac-n-cheese and cornbread). This no-frills taqueria didn’t get its great reputation for nothing. What you’re ordering: Al pastor burrito. 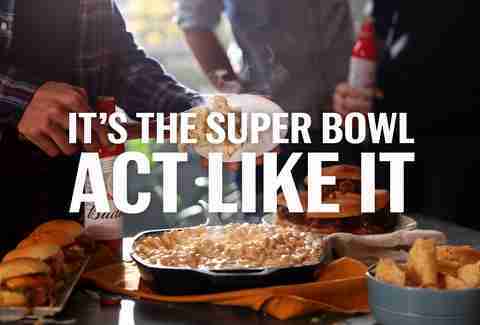 It’s authentic, it’s huge, it’s delicious, and most importantly, it can be easily consumed in front of the TV. Get your handmade tacos and quesadillas from a really sweet looking VW van straight to your door. 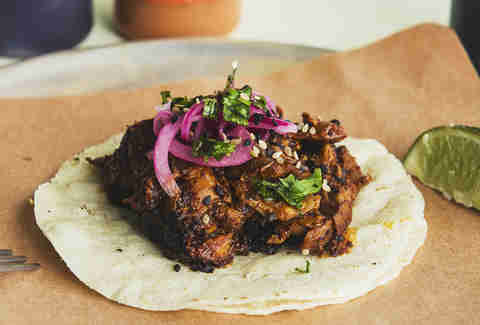 What you’re ordering: Pork belly tacos. 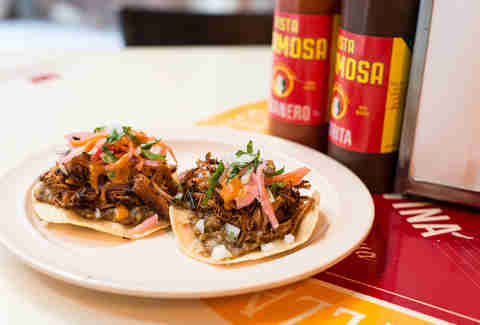 There are only three in an order, so consider the Pollo Con Mole tacos a solid second option. Parm is known for its Italian deliciousness, served up in an old-school, diner setting, but your living room will work just as well. What you’re ordering: Chicken parm sandwich. It will get all over your face and it will be absolutely glorious. 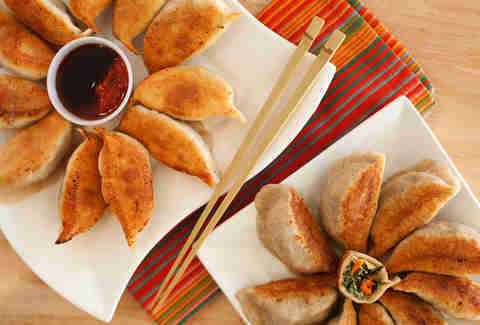 Change up your finger-food options with some dumplings -- made fresh daily by some serious pros. What you’re ordering: Peking duck sesame pancake, pork fried buns, and all the dumplings… Because the Big Game is nothing without a little dumpling extra. Count it! The lines out the door at this Nolita eatery should speak for itself. But if not, the Cuban food sure will. What you’re ordering: The Cuban sandwich and Mexican-style grilled corn (that “style” = covered in sour cream, mayo, chili powder, and cotija cheese. Yep). For Dominican fare done so right you'll probably order another round of food by halftime. Whether you've cleared your favorite joint out of their chicken wings or barely scalable mountain of loaded nachos, you're going to want to get an ice cold beer to wash it all down. Make it a Budweiser. All the creamy, cheesy, oozy, goodness you can handle… On a pizza. What you’re ordering: Whole Artichoke Pie. 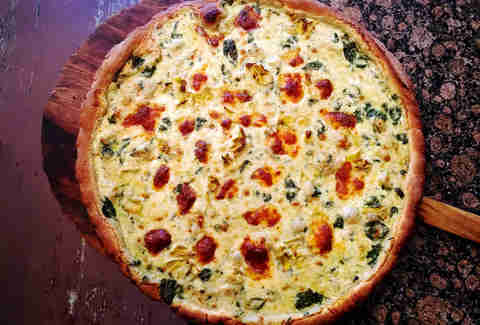 If you had artichoke dip in one hand and pizza in the other, and put those hands together, well that would be gross, but this artichoke dip pizza hybrid is anything but. There are New York pizzerias, and then there’s this East Village mainstay, known for grandma pies at their best. What you’re ordering: Lots of spicy Buffalo chicken pies. And at least one lovely cheese pizza... just for you. This hip, Harlem staple knows what the hell it’s doing with its seasonal ingredients. What you’re ordering: Buttermilk wings with sriracha aioli and cast-iron skillet cornbread. Like being at an awesome tailgate, except the burgers at this tavern are way better, and your coach is way comfortable. What you’re ordering: The Masterpiece Burger, and if you’re smart, more than one order of the bacon and scallion topped Ai-Oli fries. A 24/7 diner that has game day grub (touch)down. What you’re ordering: Chicken fingers, mozzarella sticks, and Buffalo wings. Their entire appetizer menu pretty much screams Game Day Spread. Packs in 100+ Jewish comfort food recipes, including some pretty ridiculous sandwiches. What you’re ordering: Go halfsies with The Ruth Wilensky (house-made beef salami + mustard on an onion roll) and the smoked brisket sandwich. The culinary land of opportunity - aka locally-sourced American food, and lots of it.What you’re ordering: Hanger steak sandwich and bacon mac-n-cheese. This is also your ultimate sides spot; they change regularly. Go for the Market Plate (4 sides) and fill ‘er up. 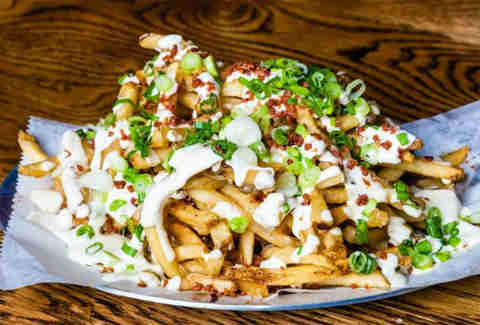 Bubby’s Dumbo is sadly RIP, but you can still a hold of their home style American eats, way better than your mom makes (shh! ), in Manhattan. 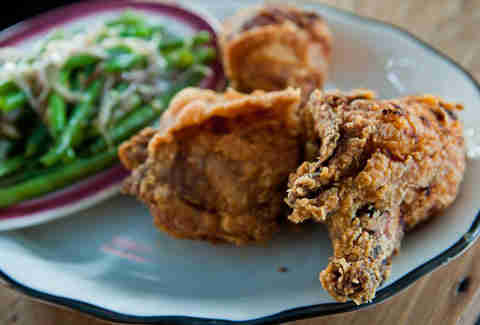 What you’re ordering: Fried chicken and Bubby’s buttermilk biscuits. You may even want to consider doubling down on this order, honestly. All the spicy Sichuan your crew can handle, and that will have to be a lot given the low price-point. What you’re ordering: Dan Dan Noodles. Before you dub this an odd game day entree, eat them. Then you won’t. 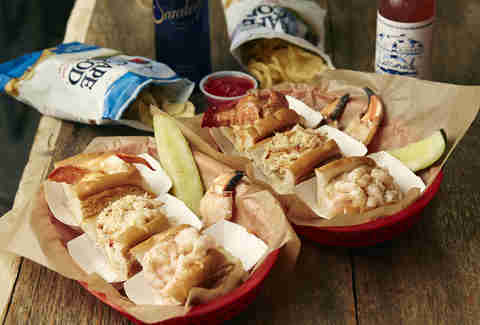 A small shack packing BIG rolls… that happen to have lobster in them, wouldn’t you know. What you’re ordering: The “Taste of Maine” with ½ lobster roll, ½ crab roll, ½ shrimp roll and 2 crab claws with slaw and a pickle. Hey, you’re on the UES. Get fancy! The ultimate sports bar with arguably the best wings in the whole damn city. Yep, we said it. What you’re ordering: The “Double Order” of Buffalo Wings. Or even a “Bucket.” Actually, maybe the “Party Platter.” You will eat them all. It’s been around since the 1800s, and still has one of the best burgers in the game. Need we say more? What you’re ordering: The Cadillac Burger. 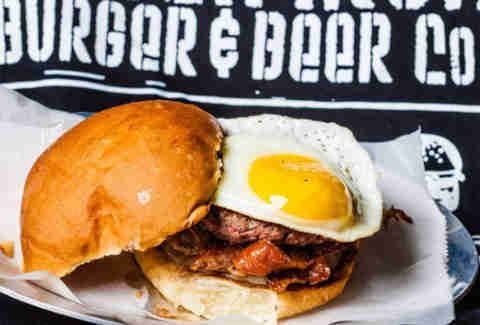 The luxury model of burgers comes equipped with double smoked country bacon, American cheese, and an optional Grilled Whiskey Onion package. This no-nonsense neighborhood joint boasts some killer thin-crust pies. Load up. 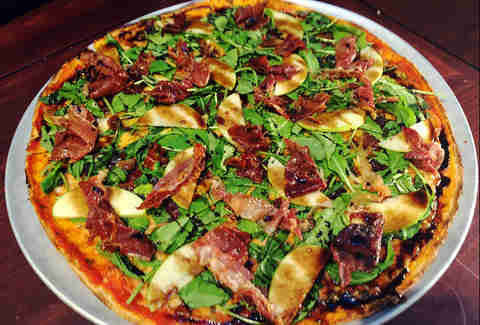 What you’re ordering: Parma pizza -- a thin crust pie covered in prosciutto crisps, millionaire bacon, arugula, green apples, balsamic reduction… and of course, cheese. Open since the ‘20s, the deli sandwiches here are no joke. Plus, breakfast all day! What you’re ordering: A slew of sandwiches, especially of the Reuben, pastrami, and roast beef variety. This counter-service eatery is basically the IHOP of wing spots. That’s about the highest compliment there is. What you’re ordering: Classic BBQ and coastal pepper (with Caribbean Jerk spices) wings. And the sriracha hinted cheesy fries, just in case. 30 rotating flavors of chicken fingers with every dipping sauce in the whole wide world should do it. What you’re ordering: The General Sticky Tso Fingers. 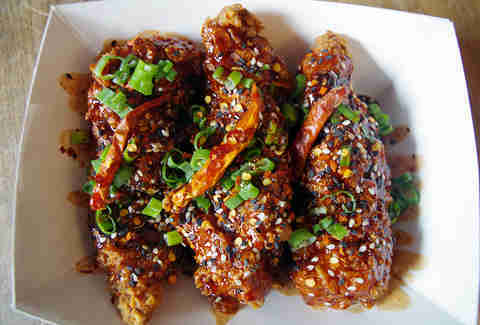 Basically all the deliciousness of General Tso (sweet, spicy, chilli peppers honey, soy sauce) in chicken finger form. Oh, and S’more fries. You heard us. Get your smoked meat, Southern style here. And also, more smoked meat. What you’re ordering: Smokes Alabama White Wings, in the “large package” (that would be 100 wings). Originally launched in the Chelsea Market, this family run restaurant thankfully expanded its comfort food wings throughout the city. What you’re ordering: The Lamb Burger with herbed fries (that are, ahem, on the burger). For kebabs and meat plates, all so affordable you can order them in serious bulk. And you should. What you’re ordering: Kebabs! And lots of them. Angus beef, chicken and lamb. You can’t lose. American breakfast meets Asian fusion here, and somehow it works perfectly. What you’re ordering: Buffalo Chicken Wrap. Wings in wrap-form = Touchdown, you!